Every jihad attack is yet another opportunity for Muslim supremacists to pout and proselytize for Islam. Never is there self-reflection in the Muslim world or examination of the Islamic texts and teachings that exhort to jihad. 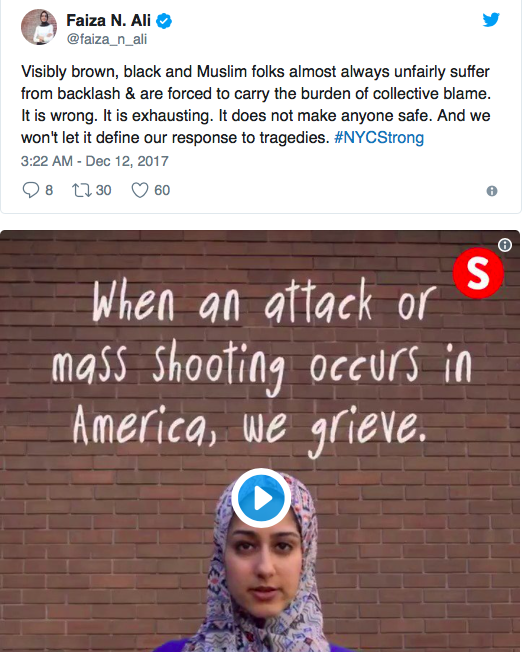 Again we are told that Muslims are the true victims and as if on cue, they post videos and memes decrying the infidel, the targets of mass murder. “Visibly brown?” Muselmanic agitprops are beneath contempt. And no, they should not feel safe wherever they are for their twisted comeback on terror committed by their coreligionists, which they are religiously obliged to cover for. War on Christmas. Jihad on Christmas. In response, the establishment media will probably call for the banning of Christmas posters. Submitting to violent intimidation is, for all too many people, the order of the day. ““Visibly brown?” Muselmanic agitprops are beneath contempt. Yes, caught my eye too. And no doubt the eyes of other visibly white, visibly brown, visibly black , visibly yellow readers who’ve come into contact with islam first hand and totally despise it.